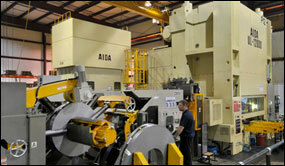 LML operates using the latest equipment and invests a great deal of effort into developing new technology. 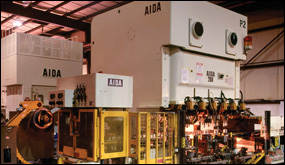 LML has installed Aida's UL1200 Ton press in 2007. This robust and precise conventional press enable us to produce high quality parts, which would normally require fine blanking or cold forging. 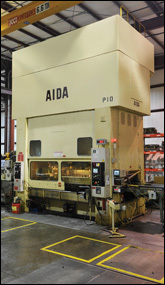 With our latest technology, we can produce specialized parts using a conventional press. This press has a coil feeder that enables us to run the blanks by itself. 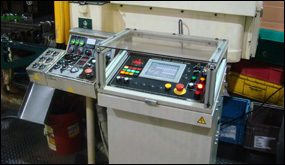 It is not necessary to make blanks for this press, which will increase our efficiency. 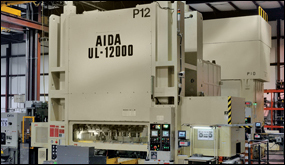 LML's UL1200ton press is the first one brought in to the US. PMX600 Ton press has 3000mm long bolster, which can produce deep draw. This press has the capability to produce part that require close tolerance specs of 7mm thick, flatness, all shear, roundness, and runout. Die change cars help reduce die change time and help increase productivities. Reliable press line up utilizing servo transfer system. 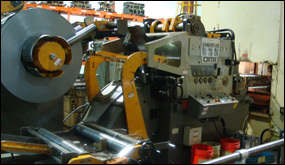 One of our oldest, most reliable presses underwent a transfer system upgrade in 2011, changing to the latest transfer system available. This has increased our productivity exponentially. 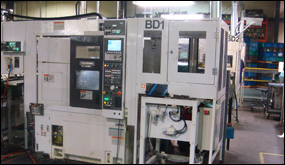 LML has added Takisawa's latest CNC lathe in its CNC lathe line up. New lathe has a gantry loader moving higher than older models that help improve productivities. 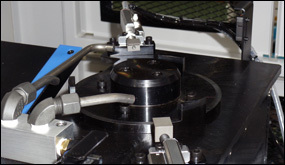 This lathe model also has an automated measuring device which feedbacks the measurement to the system and automatically compensate offset settings.